Bariatric surgery is performed to help one conquer over weight dilemmas and regain optimal health but it also comes with a huge responsibility. To be successful, you must become watchful of what and how much you consume. One of the key elements in the diet following bariatric surgery will be protein. Every muscle, cell, and organ in your body, are composed of protein and this protein tends to break down over time thus needing replacement. Replacing it becomes more critical after bariatric surgery since you now have to limit the number of calories you consume in a day. This would also mean that you need to get most of these calories from sources of protein. Protein will help you build and maintain muscle after surgery and this key for weight loss. Being on a low-calorie diet exposes you to the risk of muscle loss. Protein also helps heal your body from surgery. 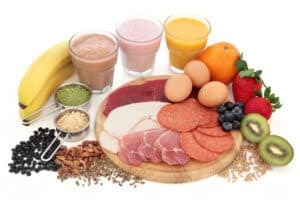 Ultimately, consumption of protein will help you get healthier skin, hair, and nails as well as boost your immune system. The other benefit of protein is that it keeps you full for longer and thus you will be less ravenous between meals. Protein provides the body with essential amino acids that it cannot produce on its own. If you’re not getting enough protein following bariatric surgery, your body functions can start breaking down. After surgery, the number of calories you consume is automatically reduced and so to get adequate amounts of protein, you will have to pay close attention not just to quantity but quality as well. Protein is often accompanied by fat and bariatric surgery is intended to help you lose weight so you must stay away from bad fat. Consider taking non-saturated fat with the protein. For instance, certain kinds of fish and nuts contain healthy fats that give the body nutrients it needs without causing weight gain. Lean meats and plant proteins are also a good source of quality protein that also provides the body with an adequate number of calories. While protein bars for are an alternative for protein intake, most of them contain elements that are found in candy bars and will, therefore, counteract your efforts of losing weight. There are protein bars made from healthy organic products such as whey and you can also make your own protein bars with healthy ingredients. The best way to get quality protein is through foods such as fish, nuts and organic meats. If you must take protein from shakes and bars, pay particular attention to the ingredients used in the making them as well as calories indicated on the packaging. Keep in mind that the details on the packaging are not always 100% accurate. It is easy for your dietician or doctor to tell you how much protein your body requires after bariatric surgery. There are also general guidelines that can come in handy. Ideally, every bariatric patient should consume between 60 to 80 grams protein on a daily basis. Patients with biliopancreatic diversion (with duodenal switch), might need up to 90 grams of protein daily. It is always advisable to follow the doctor’s recommended intake because individual needs differ and too much of protein following bariatric surgery could do more harm than good especially if the patient is not adequately hydrated. Let protein be the first thing you take. This will help you stay full so that you don’t over eat between meals. It will also help you ensure that you get your daily recommended protein dose. Try out protein shakes. They help add extra protein into your diet and they also come in many flavors that help make them more palatable. You could also add fruit or other food items such as peanut butter in your shake to add flavor. The fewer the calories in your leaner proteins, the more of it you can take. For instance, turkey and chicken have lean protein so you can take more of these than you would beef. If you’re a vegetarian, do not fret. You can still get all the protein you need from great sources such as eggs, tofu, and beans to mention but a few. Protein shakes and bars made from brown rice, soy, whey and other plant products are a great source of protein too. Keep a diary of your eating. That way, you can ensure that you are consuming the recommended amount of proteins every day.